NASCAR Race Mom: Young Todd Gilliland had a very busy #NASCAR Weekend. Young Todd Gilliland had a very busy #NASCAR Weekend. 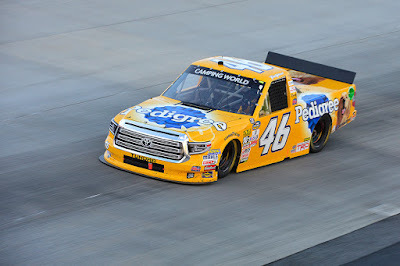 On Friday, Todd made his Camping World Truck Series debut for Kyle Busch Motorsports in the #46 truck at Dover International Speedway. Pedigree Brand will sponsor Todd Gilliland for six Truck Series races this year. "Todd Gilliland is an exceptional young talent and I expect great things from him," Busch commented. Unfortunately Gilliland ended his impressive series debut performance with an accident. He was just outside of the top fifteen on lap 116 when a wheel broke loose on his car, sending him hard into the turn two wall. The damage ended his run and he was ultimately credited with a twentieth-place finish. "I think we had some loose lug nuts there," Gilliland said. "I had a little bit of a vibration to start that run. I didn’t know what it was. I’ve never had a loose wheel. That’s something I’m going to learn from. That’s why we’re here. I’m going to be better my next race." The next day, at the K&N Pro Series East Inaugural Event at the Memphis International Raceway, Gilliland had one of the fastest vehicles. 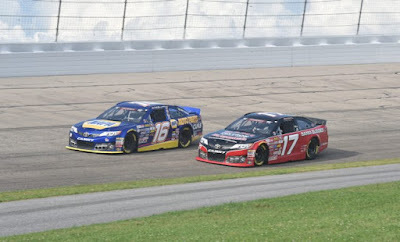 Gilliland had started the 125-lap race from the outside of the front row, after qualifying second in time trials earlier in the day. 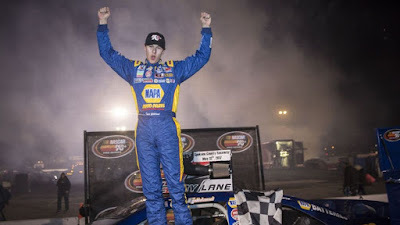 He led briefly on two occasions in the first half of the race before taking the lead shortly after the midway break and pulling away by about 15 car lengths. As he appeared headed for a possible win, Gilliland slowed on Lap 106 with a right rear tire going flat. He headed to the pits during a subsequent caution for a tire change and finished the race on the lead lap in eight place. Todd Gilliland’s resume includes twelve K&N Pro Series races and an ARCA race in addition to his 2016 K&N Pro Series West Championship. He currently leads the K&N Pro Series West standings and is positioned in second place in the K&N Pro Series East standings. You can see Todd race in the K&N Pro Series West this Saturday on June 10th at the Colorado National Speedway. Gilliland’s next truck start will come on June 17 at Gateway Motorsports Park. The K&N Pro Series East next race is scheduled for July 1 at the Berlin Raceway. Enjoy watching Todd's professional racing career progress! Alot of untapped talent! Todd has an impressive team chief Chris Lawson in the K&N Series West! Thanks for your read and comment. I agree - Todd will be fun as he moves up - lots of talent and great support staff.